Save Power on unattended windows computers. Let them automatically hibernate and Resume according to your configured weekly schedule. Use Power Saver on Windows Computers such as Windows XP, Windows Vista, Windows 7 and other Windows Versions. Download the Power Saver Software now and give it a try on Windows Computer. Just Check the desired weekdays, set time and click on the top right cross button to schedule automatic Computer Hibernate, Resume and Restart operations. 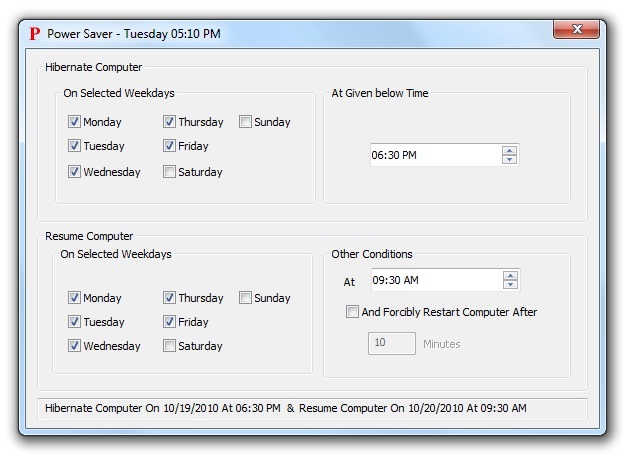 The Automatic Status Window at the bottom of the Power Saver Software will indicate about the next Hibernate and Resume Computer operations.